My son likes sleep and has always been a good sleeper but as he has gotten older he will occasionally wake up at weird hours of the night or really early in the morning! I LOVE sleep so this just doesn't work for me! We tried everything...putting him back to bed, bringing him into our bed to snuggle, yelling, punishing, everything to get him to just sleep a little longer! ...until I received the My Tot Clock and he could see visually that it was NOT time to wake up...and when it WAS! 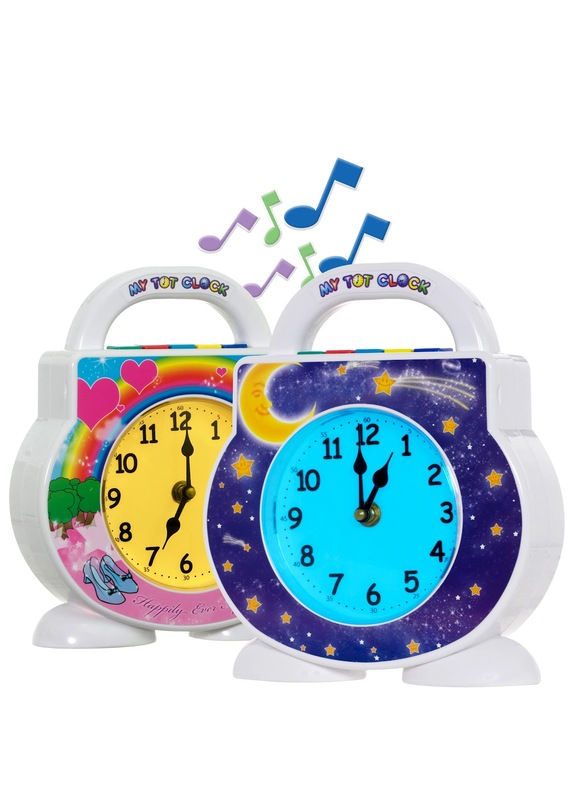 My Tot Clock is the first all-in-one sleep clock, alarm clock, nightlight, timeout timer, and activity timer for tiny tots who can’t yet tell time. The magic of My Tot Clock is that it changes color to teach little ones when it is time to sleep (blue light) and when it’s okay to get out of bed (yellow light). Parents set the routine! I love that I get to choose when my son wakes up and it really helps him stay in bed in the morning! But the greatest thing about the My Tot Clock is that it has SO MANY other features!! It is probably the most multi-tasking, versatile product I own! Among it's many features are the child-friendly analog clock display, bedtime stories, lullabies, fun wake-up music, and even white noise to make the traditionally stressful bedtime and morning routines more enjoyable. My Tot Clock also includes a light blue light for nap time or quiet play time, a red light for timeout, and a green light for any positive timed activity like potty training and picking up toys. There is a color for every time of day and it really helps my son learn what time it is by color! He knows if he sees red he is in trouble, green means he gets to play or read, and blue means Nap Time! And for him, he loves the yellow light because that means he gets TO GET UP! Best of all, My Tot Clock is a mommy-invented product (it is designed and developed by Pamela Gonzalez, President of White Dove Innovations) - and you know I love to support other mommies!!! They always have the best products because they go through the same thing I do! 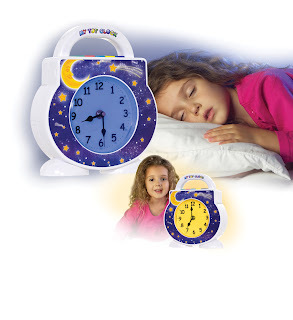 If you are looking to get a little more sleep at night or at nap time, you have got to get the My Tot Clock! I am loving those extra hours of peace and quiet and my son loves his fun new clock! Plus, it has really helped us with our schedule and helping my son remember what time of the day it is and what he should be doing at that moment - like reading, napping, or having a time out! Buy It: You can purchase My Tot Clock direct from White Dove Innovations at www.mytotclock.com for just $49.95. A selection of different interchangeable Tot Clock Faceplates are also available for boys and girls to choose from, for just $9.95 each, along with several additional Tot Clock Treasure audio bedtime stories including: Goldilocks and the 3 Bears story, The Little Red Hen, Sleeping Beauty, Princess and the Pea, The Town Mouse and the Country Mouse, and The Hare and the Tortoise, each of which comes with five lullabies, a fun wake song, and a white noise track, for just $12.95 each. Win It: My Tot Clock is generously offering (1) My Tot Clock to a lucky winner! What a great product this is. My daughter definitely needs something like this for my grandson.